The BOM recorded that Queensland had its sixth-warmest January on record. Statewide, mean maximum temperatures were well above average, while mean minimum temperatures were the second-warmest on record for January. Rainfall was mixed: above average in the north and west, below average in parts of the southeast. No tropical cyclones formed in the Queensland region in January, which is unusual but not unprecedented. On Friday 17th February the BOM forecast a Tropical Cyclone would form in the Gulf of Carpentaria over the weekend. The category one cyclone did form on Monday 20th February and was given the name Cyclone Alfred. At approximately 4am on Tuesday 21st February the cyclone was downgraded to a tropical low. 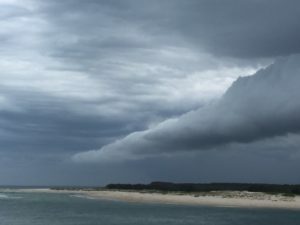 The impact on Queensland was limited apart from increased rainfall associated with the monsoon trough in the lead in to the cyclone forming. 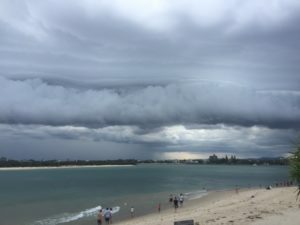 The following cloud roll was observed at Caloundra on Sunday 19th February 2017.